All cases displayed below were done by Dr. Liu. All rights reserved. 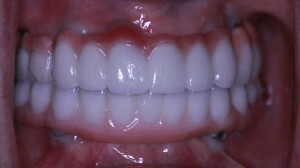 Patient received an one hour treatment of zoom whitening, and the effective results are shown. 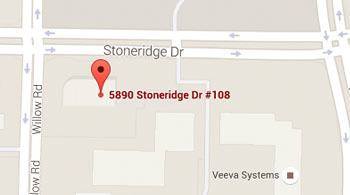 45 year-old patient came in with a fractured tooth, an extraction and implant was placed on the same day. The crown was later placed and the missing gap is now gone. Another patient has lost his tooth for over 10 years. And as his gum and bone recede, only a thin layer of bone remains in which bone grafting was needed, followed by implant and crown. Missing as well as decaying teeth were replaced by implants. It has been 7 years since the surgery, and patient has been happy since! 74 year-old patient's denture has been loose. 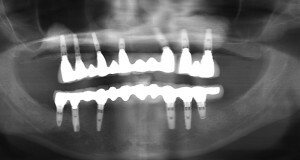 Implants were placed and the implant bar is used to secure the denture in order for it to properly function. 70 year-old patient lost all his teeth, implants were placed on both upper and lower arches. The bridge was later affixed and it has functioned well for over 9 years. Over-dentures are placed over implants after replacing all missing teeth. 47 year-old patient has severe periodontitis, which is a serious gum infection that damages gums and can destroy the jawbone. 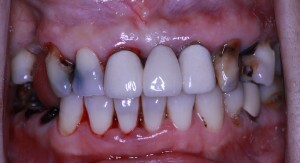 After full mouth deep cleaning and regular maintenance, infection has been controlled and health retained. 47 year-old patient lost multiple teeth due to decays; implants and crowns were used to replace them. 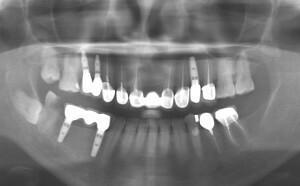 Patient has a congenital disorder of missing two incisors. Orthodontic treatment followed by bone grafting, implant and crowns were done to restore function as well as improve appearance. 45 year-old patient wanted something to cover up the space for aesthetic purposes. 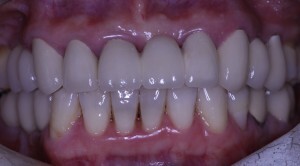 An implant was used to replace the missing teeth and the crown filled the gap. 56 year-old patient had gum disease that led to all teeth being missing. 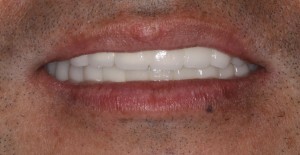 He later got implant replacements on the upper and lower arch; crowns were later placed and he exclaimed that the crowns felt like his own teeth! Patient had severe peridontal disease in which all teeth needed to be replaced due to mobility and bone recession. 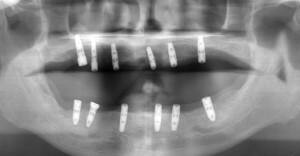 Full upper and lower implant-fixed bridge was used to rehabitate patient's oral function. Pt had multiple teeth decays with apical infection, and several teeth missing. 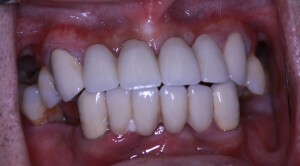 Root canal treatment, extraction, implant and porcelain crowns were used to rehabilitate this patient's oral function.